GULF SHORES, Ala. (Nov. 16, 2016) — The votes are in! 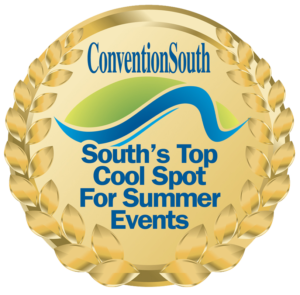 ConventionSouth’s readers and Facebook fans have selected their top 10 picks for “The South’s Cool Spots For Summer Events.” In late October, ConventionSouth Editors compiled a Facebook ballot with a list of 35 meetings destinations that are well fit for summer meetings as they offer escape from the summer heat. From those 35 “Cool Spots,” including breezy mountain retreats, refreshing rivers and oceanfront resort towns, fans were asked to vote for their top picks. The following list of 10 cities gained the top votes. The January print and digital issue of ConventionSouth will share this list with meeting planners from across the country that book meeting sites in the South. Cities appear in order by votes received. Celebrating 30-plus years as a leading meeting planning resource, ConventionSouth magazine is based in Gulf Shores, Ala., and is circulated to more than 18,000 meeting professionals located across the country that book meetings held within the South.